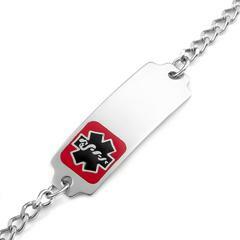 Our mens large stainless steel medical id alert bracelet I is a perfect medical id bracelet for men. This medical alert bracelet is stainless steel, and the plate measures 5/8" x 2" and has medical alert emblem on the front that is available in either red or blue. The chain is stainless steel. This mens medical id alert bracelet is great for any man.